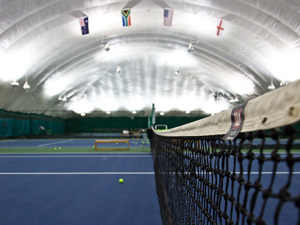 Armonk Indoor offers instructional programs for players of all levels. Learn about them below, or contact us at info@armonkindoor.com for more information. Armonk Indoor offers a multi-court clinic experience with a 4:1 player to pro ratio. Our expert staff will lead sessions that will challenge you and improve your game. Classes are offered in 1-, 1½-, and 2-hour blocks. The cost is for one day per week for the entire season. Cardio Tennis is a group program featuring high-energy drills that give players of all abilities a fun aerobic experience. It includes a warm-up, a fast-paced workout maximizing repetition of strokes, and a cool-down phase. If you want an exciting new way to burn calories and get in shape, try Cardio Tennis. Seasonal lessons allow players to get weekly focused attention for the entire season. You can even include up to three additional friends to create your own private clinic. Click here to learn more about seasonal lessons.